Catholic University third year law student Roger Abbott turned his powers of analysis upon the Supreme Court’s controversial 2010 decision in Citizens United v. Federal Election Commission as the leadoff 2013 presenter in the law school’s Student Scholar Series. Abbott’s paper was delivered before an audience of faculty members and fellow students on Feb. 20. He concentrated his presentation on so-called “dark money,” a regulatory loophole inadvertently created that permits corporations to circumvent the disclosure requirements by using non-profits as conduits for campaign contributions. 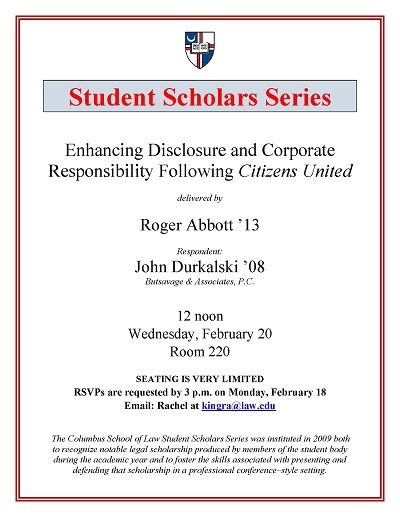 Abbott, Roger, "Enhancing Disclosure and Corporate Responsibility Following Citizens United" (2013). Student Scholar Series. 13.